It was another cool morning at Jordanelle today. I didn't check the air temperature, but it was cool enough that I didn't waste any time getting in the water. The water also felt much cooler today that it did last week. I posted a workout on Facebook on Sunday night with an emphasis on sighting. I needed to swim 3+ miles today and didn't follow the workout exactly, but I did pay attention to sighting throughout the swim. 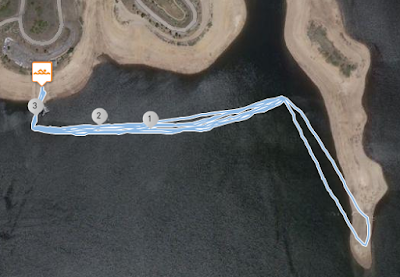 Warm-up: easy swim from ramp to green buoy then to the red buoy. Swim one loop of the eastern buoy line. Start by sighting every third stroke. At each buoy, increase the number of strokes between sighting (i.e.at the second buoy sight every fourth stroke, at the third, sight every 5th stroke). At the end of the line, you can either continue to add strokes between sighting, or start over at 3 strokes. At 5am, it's still really dark and it's hard to see the buoys on the way out on the first lap. I just counted strokes between each buoy and was able to find them about where I expected them to be. I was thinking a lot about our upcoming Bear Lake Monster Swim this weekend, hoping for good weather. It looks like there may be a couple storms in the day leading up the the swim, but Saturday looks good. It will likely be a bit chilly at the start and then warm up to a comfortable temperature. I'm planning to swim across with Chad, Sarah, and Gords early Friday morning before the race. I hope the weather is good. I'm a little worried about getting cold swimming that early in the morning with air temps in the low 50's and swimming at a slower pace than normal. The good thing is that there will be other people in the water with me and a boat watching over us. I'll be racing the 1 mile swim on Saturday morning and hope I'm not too sore. I finished at 3.05 miles this morning, right about where I wanted to be. When I checked the thermometer on my watch it showed just under 70 degrees. I guess I was right about the water being cooler. I saw Goody, Jill, Tim and one other person there swimming this morning. It's always good to see other people out in the water. I'm planning to swim again on Wednesday morning and will post a workout to the Facebook page Tuesday night. I'm thinking of either posting an "adversity" workout or a time trial.